The trusted name for distance moving in Georgia and beyond is Bulldog Movers. Since 1982, we have been serving residents and businesses in Atlanta, other communities in the Peach State, and throughout the country, providing excellent relocation services for fair competitive prices. 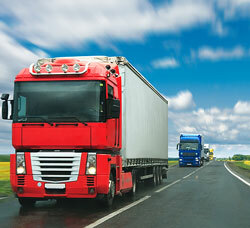 When moving a great distance, it is important to choose a company with moving trucks that are suited for the long haul. At Bulldog Movers, one of the facets of our business that we are most proud of is the trucks that we use. We have a fleet of nearly 30 moving trucks, all of which are painted bright red and are easily recognizable. What makes them so special, though, is that they are larger than the moving trucks used by most other companies offering distance moving services in Georgia. This allows us to use fewer trucks to complete your move, and to get it done more quickly as well. Our trucks are also equipped with air-ride suspension, ensuring a very smooth ride for state to state moving. And, because our trucks have GPS tracking devices, you can always know the exact whereabouts of your possessions with a call to our office. Each one of our professionals Georgia movers works full-time for Bulldog, does not smoke, and has extensive experience in the moving industry. They are well trained in the appropriate lifting, packing, and moving techniques, and will treat your belongings as if they were their own. If you’d like to find out more about our distance moving services offered in Georgia and throughout the country, please call or e-mail Bulldog today.